December 3 • 7 p.m. Learn to make decorative holiday wreaths for free with supplies provided by the Folk School. The wreaths created will be used to beautify the Folk School during the holiday season. For more information please call Tammy or Kim at our office at 828-837-2775. Limited space available. December 5 • 9 a.m.-12 p.m.
Join the fun of decorating the Folk School for the holidays. Decorations will be provided. 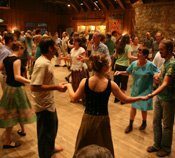 Call the main office at 828-837-2775 or email us at info@folkschool.org to sign up. Space is limited. December 6 • 10 a.m.-5 p.m.
Shop for one-of-a-kind gifts in our beautifully decorated Keith House and Davidson Hall (next to the Craft Shop). 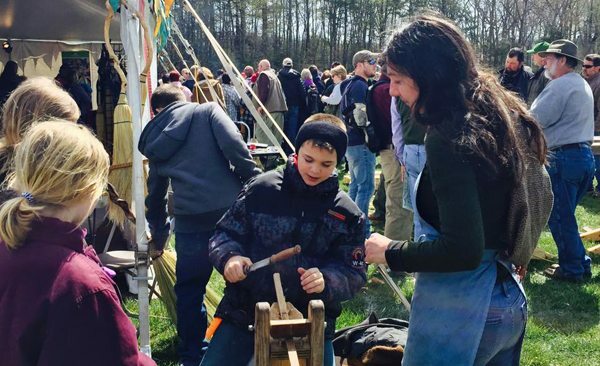 Craftspeople will offer handmade items such as jewelry, weaving, forged iron, photography, quilts and turned wood. Enjoy homemade refreshments such as sweet and savory scones, cookies, and gourmet coffee from the Brasstown Morris Dancers. Watch the Brasstown Dance teams’ performance at 3 p.m., outside of Keith House. Our Craft Shop will be open during the Fireside Sale, and is offering 15% off all items through December 24. December 7 • 7-8 p.m.
A holiday musical performance by David Brose and Kathleen Secrest. December 9 • 7 p.m. In period costume, Bob Grove will present a dramatic reading of the classic tale, including character voices. In the familiar story, miser Ebenezer Scrooge is visited by the ghosts of Christmas Past, Christmas Present and Christmas Future who, in the course of a night, convince him to abandon his “bah, humbug” ways. December 9 • 8 p.m.
After enjoying Bob Grove’s reading of A Christmas Carol, don’t go anywhere! Stay for a lively and fun performance by the Morris, Garland, & Rapper Sword dancers! December 10 • 7 p.m. Celebrate the holiday traditions of a community with sometimes serious, sometimes zany lessons and songs. Lessons poignant or humorous on Christmas, Wassailing, Food, Hanukkah, Giving & Receiving ~ Food, Coming Home, Singing, and did we mention Food! Put your bells on and come join the fun! December 11 • 7 p.m.
Brasstown Ringers, the community handbell group of western North Carolina and north Georgia continues to challenge its ringers and its audiences with new and exciting music, as well as old favorites. December 19 • 1-3 p.m.
Be sure to come over to the Folk School for the fun. The Holiday Kids’ Party will have music, dancing, activities, a visit from Santa, and best of all, home made gingerbread cookies! Call our office at 828-837-2775 for more information. December 19 • 8-11 p.m.
Free admission! Come celebrate the holidays with us on the dance floor. The calling and music will be a splendid array of local talent. Guest callers welcome (If you are interested in calling let us know in advance by emailing Annie Fain). Beginners, couples and singles are welcome. Also, we will have a holiday treats potluck! Bring your favorite refreshment to share. Evening dances during Winter Dance Week are open to our local dance community. There will be a mix of contras, squares and English country dances. These dances coincide with our winter dance week. Dec. 26-Dec. 29 • 8-11 p.m. Admission: $10 per dancer, per night. Dec. 30 • 8-10 p.m.
Dec. 31 • 8 p.m.-1 a.m.
Join us for Winter Dance Week! Ring in the New Year at the Folk School! 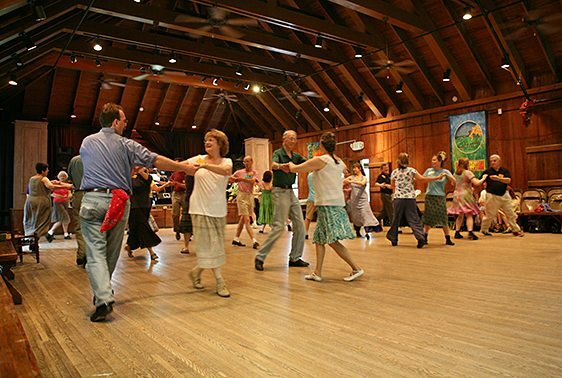 This popular year-end traditional dance and music celebration will feature American contras & squares, English country dancing, Irish set dancing, rapper sword, partner dance technique, waltz, group singing, jam sessions, and more. Enjoy glorious live music by Mavish (Jaige Trudel, Adam Broome, & Matthew Olwell), A Joyful Noise (Barbara Greenberg, Daniel Beerbohm, & Kathy Talvitie), DoubleDate (Joyful Noise, joined by Bob Pasquarello), and the Canote Brothers. 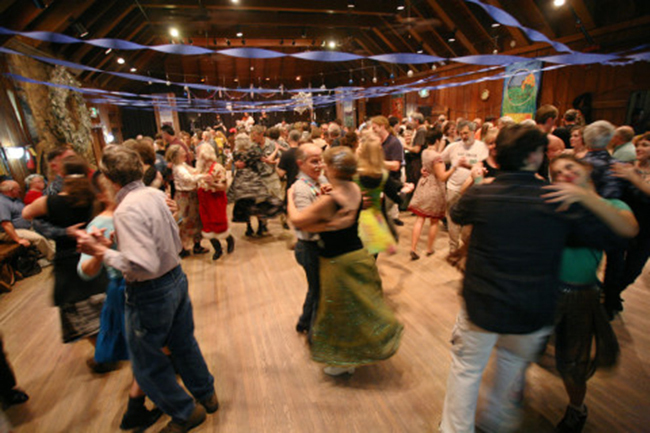 Winter Dance Week offers a unique combination of top-notch callers, teachers, and musicians – along with beautiful surroundings, good food, comfortable accommodations, and a relaxed, friendly atmosphere. A Gala New Year’s Eve Party and New Year’s morning breakfast will finish off the week. 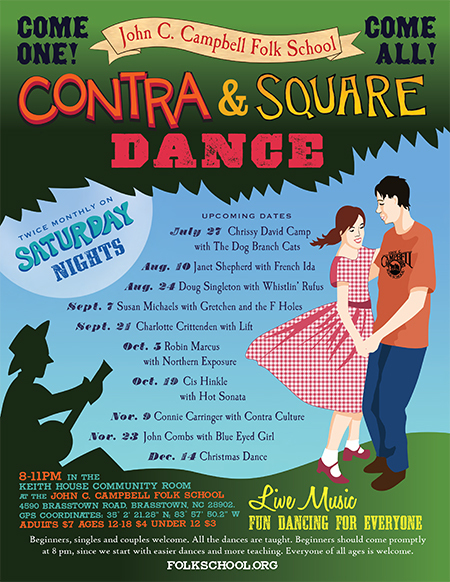 Participants should have previous contra dance and/or English country dance experience (such as our Learn to Contra Dance class or the equivalent). We do not recommend Winter Dance Week for beginning dancers.